Last night Dave couldn’t sleep because of his cold so he went in the living room and watched some tv. Well, at 12:45am he woke me up because one of the ewes went into labor and he could hear her pushing over the baby monitor we keep in the barn. 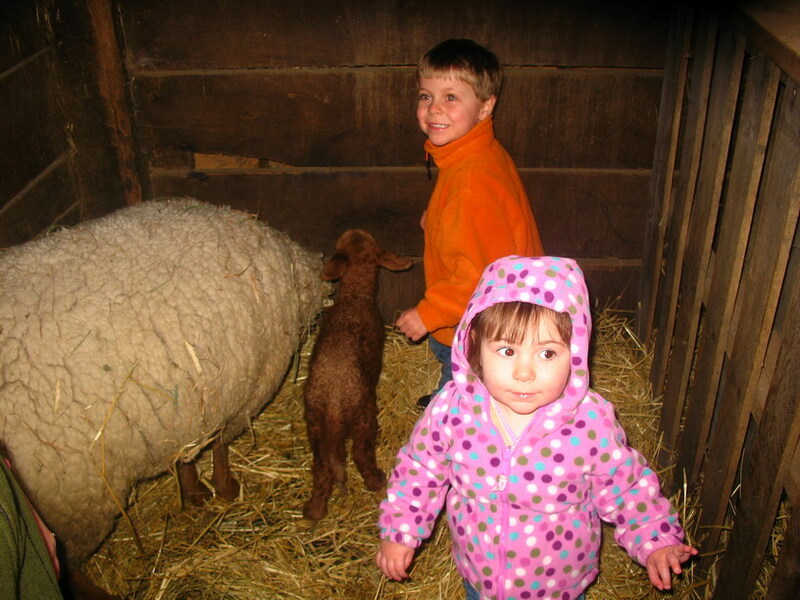 We got out to the barn pretty quick with my lambing box and discovered it was Abigail who was in labor. We moved her into a smaller lambing stall (or jug) and persuaded Rosy and Annie to return to their “ladies in waiting” stall. We got some things together and sat by the straw bales to wait. Midnight and Tiger were very happy that we finally decided to come join them in sleeping in the barn. 🙂 Not much happened so we decided to go back to sleep for 30-45 minutes and do another check. At 2:15am, I mean 3:15 daylight savings time, we went out again because we still heard pushing. I checked and only saw 1 hoof….not good. I felt around and found the other foot quickly. It was bent at the “ankle” and corrected easily, but the emerging legs didn’t look like front legs. I felt around again and found a tail….not good. The next time Abigail laid down to push, Dave knelt down and held her for me. I attached my lambing cord to the lamb’s legs and, with each contraction, pulled. Poor Abigail was a trooper through the delivery. Dave said she chewed on his jacket when she was pushing. We had to get that baby out quickly so that it didn’t start to breathe while still in the birth canal. Pneumonia can develop when fluid gets in the lungs. We got the lamb out – a ram – and cleared its nose…after a little chest rub he started breathing and shaking his head. What a big boy! After mama cleaned him off and he stood up I weighed him… 12lbs! No wonder he didn’t have a twin! I finally got back to bed at 4:15 daylight saving time. What a night to be out in the lambing barn! And I had to teach Sunday school this morning, too! Whew! This entry was posted in farm, sheep and tagged Abigail, Annie, farm, lambing, lambing difficulties, lambs, Rosy, sheep, Tunis. Bookmark the permalink.